In this edition of RAGEMAP we will all work simultaneously for 1 week. The RAGE starts on the 21th of July and ends on the 28th (your own timezone). All entries must be handed in by Sunday the 29th. All parts will then be added to the spawn room by Hezus. 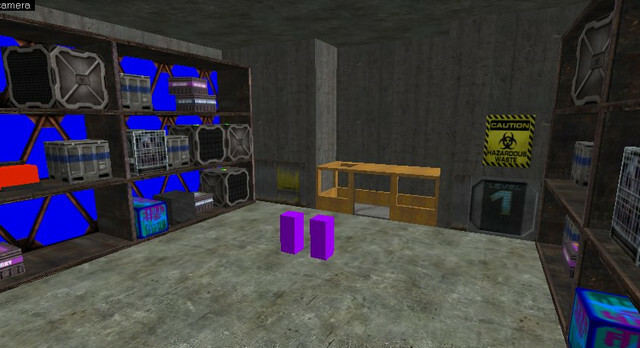 The map features a RAGECUBE, which you can use for a gameplay element. Players will always return to the spawnroom after finishing a part, because that's where the next door opens. Update: First round is done. Parts for the new round must be handed in by August 19th. There are a limited spots left. Please refer to our Discord Channel to join in! - Put as many hours in it as you like, as long as it's done within that week. - Make something fun and playable, not just random bullcrap. - Custom content is ok, but keep the filesize low (only a few megs per person). - Using the RAGECUBE is encouraged but not mandatory. - Don't hog all the engine resources and optimise your map before handing it in. - Make sure your targetnames/triggers have your own prefix, so we don't end up with problems (eg. hezus_door1). - If you are using texlights, please use the light_surface entity. There will not be a RAD file. - When using texlights, make a copy of the light texture and add it to your custom WAD. (eg. "light3a" > "hezus_light1"). This way we don't overwrite eachothers light properties. - The spawn area has 16 doors and 4 ceiling vents as possible connection points. You can even blow up a floor tile if you want. Or use a sudden teleporter. - Make sure there is a hallway leading from the spawn entry point to your part with a corner in it. One, because of VIS and two, so you don't overlap other parts. - Because of overlap, I might have to move (or rotate) your part to another entrypoint. If your part only works properly in a certain direction or angle, let me know. - Your part must end with a trigger, so it opens the next entrypoint to the next section. - Pack up everything into a correct folder structure starting with the 'svencoop' folder. Put your RMF in the 'mapsrc' folder. BSP is not necessary. - You can upload it in this thread or send it to me on Discord. If necessary, with a brief explanation of how your part works. Last edited by Hezus; 07-08-2018 at 08:36 AM. Why not over 20 mb? But bsp visblock always saves much bytes. 20 mb is not important. It should be whatever if you feel to play than map is big or small like you have fun of gaming. You mean hallways like my curvy hallway or whatever? I want know what do I should make map. But I am not sure if I join or not because I'm busy to education time in Switzerland. When Ragemap releases? In October / November ? With 20mb Keen means the custom content. It's ok to add some textures, sounds and models in there, but we don't want people uploading 100megs of mp3 for instance. The latest rules don't state a limit of custom content, I just expect people to be reasonable. The hallway can be whatever you want, as long as it properly blocks VIS. If we don't do that, you could look into all parts straight from the spawn area and we'd end up with 2000 wpolies. If you want to join then just start mapping starting saturday and hand something in a week after. If you can put something fun together within a few hours then go for it. Forgot to add that! It uses half-life.wad / zhlt.wad / nw.wad. My Sven Coop is already updated. You mean I need map propreties -> Smart edit -> Find "scversion2" than replace 517 to 516 patch. Why does it happen for downgrading? Does current version fail for release or development went wrong? Oh, that's my bad. I had the FGD of the internal version (5.17) set up when I made that spawn room. ...or just use the option that's already there. It happens because the map was created on our internal game, which sets the map's game version to 5.17. That's all. Just lower it to 5.16 and you can run it as normal. Not a big deal. I copied the posts starting from Hezus' rules into a new thread to make it easier for people to read the rules and join. @CryoKeen: If people are just being reasonable, optimise their maps and don't do something horrendous, we should be fine. Also, the modular approach makes it really easy to create a level change, so engine limits shouldn't be too much of a problem here. Ragemap starts in 48 hours? What timezone does it start? Would love some limits, you say a few mb, i assume that doesn't mean included textures. Also idk how to use texdatalights (only rad file) or that new light entity. Can someone post a link to ORIGINAL SVENCOOP RAD file that shows all lit textures? Ragemap starts whenever it's saturday the 21th in your timezone. Seeing it runs for a week, we don't really need a universal kick-off time. Custom content: no limit, but be reasonable. People have to be able to download this quick enough on slower ADSL connections. So don't go crazy. If you use light_surface entity, you don't even need a RAD file anymore, nor all the values. You only need to set a brightness. It's a brilliant entity. I wrote something on it here. // Resolved and continue my work! Last edited by SourceSkyBoxer; 21-07-2018 at 10:44 PM. @Hezus#1599 should we not set a clipnode limit?? some people will be more conservative, some will use more. Also are we going to allow PlayAll music or Sounds play from peoples sections? Also is more than 1 section going to be opan at a time? A new section opens once one is done. Then I can close off the previous section if that's necessary. Don't know what a good clipnode limit for this project. If something is just too utterly complex, we can always move it to a 2nd map or optimise it. Music is fine, but try to make a short loop, so the filesize stays low. And yes, post WIP pics! WE WANT YOU TO JOIN RAGEMAP! Everyone and anyone is encouraged to participate regardless of your map skills, we would love to see your box map with a light included in ragemap, you could be the next Davinchi, RNG, CryoKeen, Nih, Adambean, Streamfox, Trempler, or other mapping god! Please be professional in all rooms except for the "whatever" room. Please also be respectful in that room. If you have no Mapping Experience just install the Sven Co-op SDK located in Tools I believe after you've downloaded Sven Co-op, watch this 10 minute how to video I made with Subs in English and Espanol! If we are working maps if they are not finish???? Wow it looks like warehouse, right? Correct! just this room though. The Yellow elevator will lead players into an underground cave system.